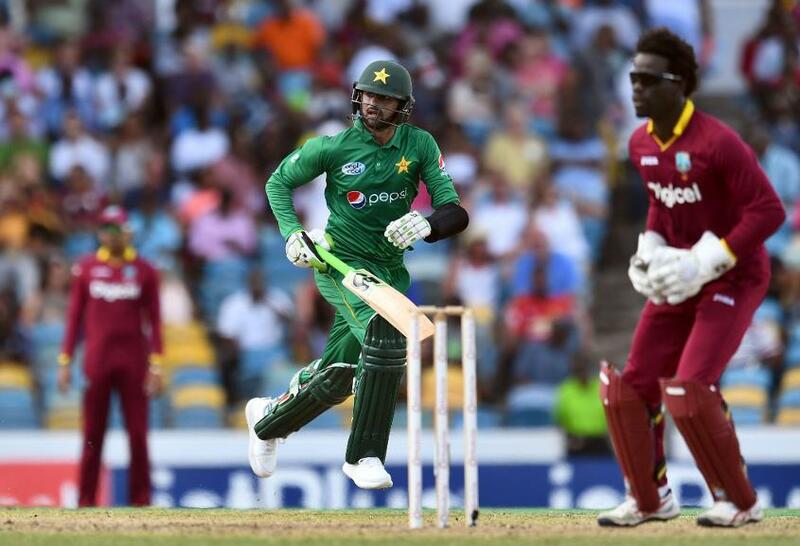 Shadab Khan produced a record-breaking performance on debut to lead Pakistan to a six-wicket win over West Indies in the first game of a four-match Twenty20 International series on Sunday (March 26). Shadab took 3 for 7 in four overs, the most economical figures ever on T20I debut by a bowler completing his four-over spell to restrict West Indies to 111 for 8. Pakistan achieved the target in 17.1 overs, with Shoaib Malik's unbeaten 38 (29 balls) steering the chase at the Kensington Oval. West Indies was put in on a bright, breezy afternoon, but the batting line-up didn't click resulting in Pakistan registering a fourth straight T20I win over the ICC World Champions, following a 3-0 sweep in the United Arab Emirates last September. In the chase, Pakistan had some moments of wobble at 49 for 3 in the ninth over, but Malik got together with Babar Azam to put on 46 runs for the fourth wicket and steady the chase. At the start, Shadab's mesmerising mix of leg-breaks and googlies put Pakistan firmly on top. The 18-year-old was brought on as the fifth bowler with West Indies having first use of what looked like good batting conditions, but his guile meant the home team couldn't get away. The West Indies total was propped up by Carlos Brathwaite's 34 not out off 27 balls with a couple of fours and sixes each. Brathwaite, batting at No.8, dominated a 37-run partnership with Jason Holder, who was dismissed off the last delivery of the innings. Shadab removed Chadwick Walton, the opening batsman and wicketkeeper, and Lendl Simmons, the dangerous middle-order strokeplayer, in his first over before adding the scalp of Sunil Narine in his second. He could have had a fourth wicket, but Kieron Pollard survived a chance when he was dropped at backward point. The home team didn't have a good start, with Evin Lewis run out in the third over via a direct hit by Ahmed Shehzad. Marlon Samuels was the next go go, lbw to Imad Wasim. Thereafter, Shadab struck and West Indies couldn't recover. “There is no letting up from here,” said Sarfraz Ahmed, the Pakistan skipper, after a win that made him just the third captain to start his tenure at the helm in T20 Internationals with five consecutive wins after compatriot Misbah-ul-Haq and Sri Lanka’s Kumar Sangakkara.